Pharaoh’s Gold Classic Slot Guide & Review - Casino Answers! Pharaoh’s Gold is a 3-reel, 3-line classic slot machine with an Egyptian theme from Realtime Gaming. It has wild symbols and a progressive jackpot. You can play Pharaoh’s Gold at . Pharaoh’s Gold is nickel slot. The minimum bet on a spin on Pharaoh’s Gold is $0.05 and the maximum is $0.15. There are sound effects that play at intervals, such as camel noises and a coconut falling out of a tree (along with an accompanying animation). To play Pharaoh’s Gold, you must first buy a chip. The denominations are $5, $25 and $100. Buy one (or more) and the chip will be deducted from your balance. You may cash out at any time and the unplayed money will be returned to you. Once you have a chip, you can place your bet. Hit the “Bet One” button once to bet one coin, twice for two coins and a third time to bet three coins. Then hit “Spin Reel.” If you want to bet three coins, you can also hit the “Play 3 Credits” button to bet and spin the reels automatically. If you play one coin, you will only have the center payline active. If you play two coins, the top line will also be active. We recommend that you play with all three credits so you can take advantage of all winning combinations and be eligible for the progressive jackpot. When you come upon a winning combination, a sound effect will play and credits will be added to your game balance. You can see details about your win below the paytable. Pharaoh’s Gold has a wild symbol that will substitute for any symbol in order to create a winning combination. When an eye symbol is a part of a winning combination, it will transform into the symbol it is substituting for. There is a non-paying symbol in Pharaoh’s Gold, the Golden Anhk. When this symbol appears, it can spoil a winning combination. The Pharaoh’s Gold slot machine has a progressive jackpot that is displayed above the reels. To win the Pharaoh’s Gold progressive jackpot, you must hit three pharaoh symbols in a row on a payline on a three-coin wager. If you do not bet three coins, you will only win 50 coins if you have three pharaohs on a payline. 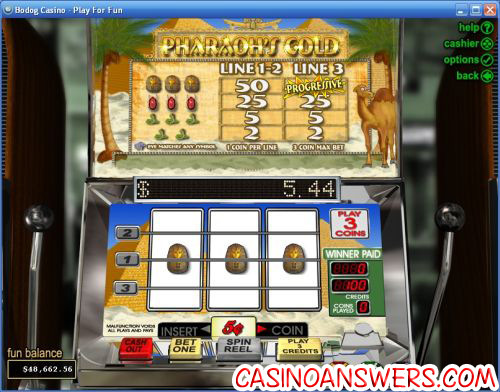 Pharaoh’s Gold is a good 3-line classic slot machine that simulates a land-based slot machine very well, while at the same time not limiting itself to being a land-based slot. If you’re looking for a classic slot machine like Pharaoh’s Gold, you can get a $888 casino signup bonus at Rushmore Casino. I’m located in the United States. Which online casinos can I play Pharaoh’s Gold at? Many RTG casinos do accept players from the United States. We recommend you play at Bovada. Are there any other Egyptian-themed slot machines out there? There are many slot machines with similar themes (and similar names) to Pharaoh’s Gold. You may be interested in our Pharaoh’s Fortune Video Slot Review. What is the Pharohs gold slot machine? Where can I read information about Pharohs gold?